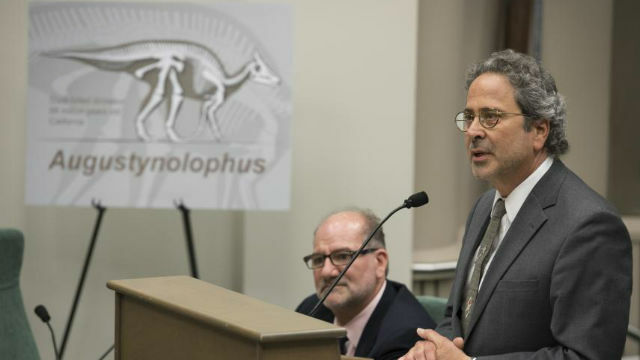 How apt that the California State Assembly recently voted to make the duck-billed Augustynolophus morrissi the official state dinosaur. It existed 66 million years ago, lived by the beach and was a vegetarian! If AB 1540 is eventually signed by the governor, this retro reptilian will allow California to join just seven others states with such a distinction. Why do we need a state dinosaur? The proffered answer: to increase interest in education. And what a mascot for California! Indeed, what better metaphor for the equally slow moving state legislature—ignoring the needs of the future—while admiring extinct fossils. Perhaps they might look at a bill receiving much less attention, that is being debated next Wednesday, April 26, in the Senate Education Committee. No, not the sunset in Malibu, Ocean Beach, or even Eureka. SB 769 will kill the “sunset provision” in one of the most enlightened pieces of legislation to come out of Sacramento since former Governor Pat Brown forged the University of California system. The “sunset” that needs to be killed is the clause that threatens the pilot program for newly offered baccalaureate degrees in high-demand fields such as health-information management, cyber-security and computer coding at community colleges. Nationwide, a quarter of Millennials who live at home neither work nor study. In San Diego County, there are approximately 43,000 youths who are neither in school or employed. That constitutes a lot of youth at risk of being disconnected, disinterested and permanently disregarded. That is precisely, what SB 769 addresses. It intends to kill the “sunset” that threatens the future of these programs. That sunset was built into the original SB 850 by then San Diego state Sen. Mary Block in order to judge its success before allowing for expansion. Even though the pilot programs in the chosen 15 community college districts (including San Diego) have succeeded. Even though businesses are clamoring for more such educated students. And, even though over two dozen states already offer baccalaureate degrees in these fields, the California state legislature still wants to discuss it—rather than expand and accelerate it. At least SB 769 will also improve things (at least in a small way) by removing the “one pilot program per district” requirement. That irrelevant proviso deserves a burial. The San Diego Community College District alone could handle a dozen more programs. They have the staff, the talent, the will, the leadership and the experts to make it happen. Community colleges are a great community resource: cheaper than for-profit schools, more expansive in outreach—accessible to all wanting to learn–and now, in the forefront of accepting the challenging 4th revolution of artificial intelligence and biotechnology with work-force demand education. Let them do their job. These colleges could help California students manage “escape velocity” from heavy debt and low-paying jobs, while catapulting them into the ranks the middle class. Surely, these potential learners and earners deserve as much attention as Augustynolophus morrissi.